While most people lead quiet, uneventful lives, chances are there were rowdy fun-filled teenage years or epic adventures in their mental scrapbooks, and quite often they are things you don’t want to fill a photo album with. Drivers are like that, too, making it clear why insurance rates are so high for younger drivers, but over time, those reckless impulses fade and you learn to drive more politely and calmly. Well, not all of us. I’m well into my fourth decade now, and still, every time I am at the head of the line waiting for the light to turn green, some animal instinct rears its ugly head, and all I can think is, “I gotta beat this guy.” This guy, who is in a ’93 Grand Caravan with construction materials loaded to the windows, ladders on the roof, and more rust than paint showing. Even when I control the urge and mildly crawl through the intersection, letting everyone walk away from me, the adrenaline is spiking and I am clutching the steering wheel like it is my last lifeline. 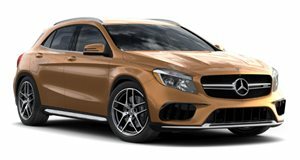 Well, if this happens to you, here we have the exact opposite of the cure: The 2018 Mercedes-AMG GLA 45. Yup, it’s a respectable Mercedes, and a family-friendly hatchback body style, with four doors and 14 cubic feet of cargo space in the trunk, and I had child seats installed all week long, but dear lord, this thing is the devil’s lovechild with Cole Trickle. It may be dressed in a sharply tailored business suit, but it is fast, furious, and constantly trying to lure you into acts of hoonage. The 2.0-liter four-cylinder turbo is the most powerful of its kind on the planet, making 375 hp at 6,000 rpm, with backup vocals of all the right kinds of noises when you get on it. And even better noises when you step off and brake hard for corners, the gear changes punctuated by shotgun pops from the exhaust in gleeful abandon. Coming off the line, it can feel like an eternity getting to its torque band, the massive turbo spooling up and throttle tip-in delayed – I’m convinced it’s to protect the all-wheel-drive differentials and seven-speed dual-clutch gearbox. But boy, does it pack a wallop once everything is hooked up, the 375 hp matched by 350 lb-ft of torque from 2,250 to 5,000 rpm, the turbo pushing up to 26.1 PSI of boost to reach those ridiculous numbers for a little four-banger. Once the driveline gets spinning and all the power is at the tires, it explodes with speed, the GLA 45 reaching 60 mph in 4.3 seconds, but most of it covered in half that, and that second half a blur of face-bending g-forces and maniacal giggles. It is hilariously fast, but it’s not a one-trick pony, and the GLA 45 AMG loves corners just as much as it loves to rocket off the line. The thick, contoured steering wheel with -wrapped grips is set up with a decent heft, so you have to put some muscle behind it, but it dives into corners without hesitation, and remains dialled in with good feel throughout the turn. Although the AWD system is front-drive based and you can push it to understeer, it can send up to 50 percent of torque to the rear axle and works with the optional limited slip front diff to balance power getting out of corners. Our tester was optioned up with the 20-inch wheels and the 235/40ZR20 Continental ContiSportContact tires provided excellent grip to feel out the capabilities of the chassis. The big brakes had stupendous stopping power, both the 13.8-inch front and 13.0-inch rear discs drilled and slotted for better cooling. The suspension features spring struts and wishbones in front and wishbones with control arms in the back, and the optional Ride Control adaptive damping system can take it from Punishingly to Unforgiving – this car is always in sport mode no matter what the dial says. It does offer an even firmer foundation on which the drive modes can exert their influence, with quicker steering reactions, throttle and transmission settings. It is absolutely frantic in Sport+, probably too frantic for everyday use, and I found Sport to be responsive enough without getting too jittery. It even has a Race setting should you take this smallest AMG to its natural habitat, a track or autocross course, or you can mix and match the settings in Individual. Likewise, the transmission can do its thing in auto mode in lockstep with the Drive mode, but it's not the most savvy transmission in the segment, so it's good you can take full control using the paddle shifters in manual mode. If I’ve given the impression up to now that the GLA 45 is always on, well, that is only half true. It is always on and ready for you to take advantage of at any moment, except for a slight delay before the transmission wakes up between cruising and attacking, but there is a reprieve in Comfort mode. Although it doesn’t take much of an edge off in terms of suspension cushioning, throttle is more relaxed and the gearbox finds higher gears quickly, keeping the engine in its safe zone and allowing you to just get from A to B if you can keep your adrenaline impulses in check. As mentioned, it has all the capabilities of a as well, with seating for four (five in a pinch), the second row short on legroom but plenty of headroom, and the front seats might not be on the level of the with dynamic bolsters, but they grip you in place with alcantara inserts without being too aggressively bolstered like some hot hatches that try too hard – I’m looking at you Juke Nismo R and . Trunk space is good for a sizeable grocery run at 14.8 cubic feet, and the rear seats fold down for up to 43.6 cu-ft, but more useful is the nifty little pass-through window that allows for long items like skis to be loaded without sacrificing the four main seating positions. While the GLA was updated for 2018, it isn’t a clean sheet design, and it generally keeps all the good and the bad elements from the car’s launch. Mercedes’ COMAND infotainment is a quick study, and the screen is positioned for excellent visibility, with the control knob falling easily to hand on the center console when you rest your elbow on the armrest. It works ergonomically, but visually it’s a mixed bag: the circular vents are cool, especially with the red rings, but there’s a lot of plastic, not necessarily of the quality you expect from the Mercedes brand, and not everyone likes the iPad-stuck-on-the-dash look of the display or an old-fashioned number pad right in the middle of the center stack. While the interior in our tester was fairly basic, there are various packages that add some visual punch, while others raise the performance threshold. The $6,300 AMG Performance Studio Package goes with yellow highlights on black, the two-tone theme carried over inside and making this look like the souped up racer it is. Then again, if you want to skip the flair and max out the performance, the AMG Dynamic Plus Package is $2,800, adding AMG Ride Control Sport Suspension with 2-stage damping, Limited Slip Front Differential, a higher top speed, and that Race mode I mentioned earlier, and a set of Recaro sport seats runs $2,250. With a starting price of $50,600 and $850 destination charge, it’s fairly easy to keep it under $60K if you don’t go option happy, so it represents good value for a sports car of this caliber. However, charging an extra $350 for Apple Carplay/Android Auto integration is a money grab and Mercedes really needs to get with the times and make that standard. It’s not cheap, and it’s not very big, but it is hugely entertaining, and we love that Mercedes has found a sweet spot serving the grown-up hot hatch fans out there while also capitalizing on the popularity of the crossover.